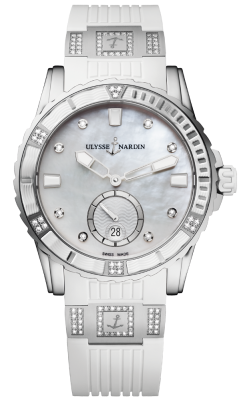 40mm polished stainless steel case, set with 147 diamonds, automatic movement with date, and glass exhibition case back. 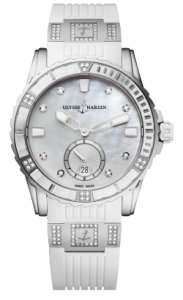 Diamond bezel and White Mother of Pearl Diamond Dial. Available on sporty white rubber strap and folding titanium folding buckle. Join us on Instaggram and Facebook. We’d love to have you.